Meet the fantastic features of Community Cloud. In today’s business world, connectivity — across multifaceted teams and in real time — is an expectation of every company's customers, partners, and employees. Your customers expect instant engagement; your partners expect meaningful collaboration; and your employees expect company-wide access to the resources they need to excel. Community Cloud was designed to meet this challenge. By integrating all of your business processes in a single, user-friendly system, Community Cloud reinforces your brand's commitment to engaging customers, partners, and employees in the ways that matter most to them. Key to that goal are five of our favorite features: community management, business process integration, personalisation, file sharing and collaboration, and mobile-first functionality. 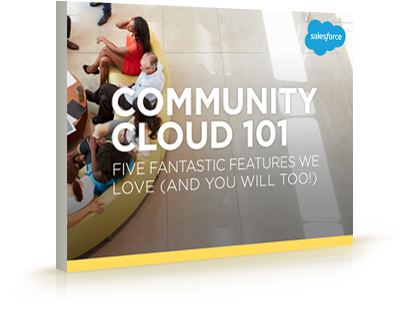 Download our e-book to learn more about how Community Cloud can revolutionise your business.